Jabulile Elizabeth Ngcobo is a very energetic hardworking young female farmer. She really started farming out of hunger and saw it as a means to provide for her family. Where and how many hectares are you farming? What do you farm with? I am a communal subsistence farmer near Sheepmoor in the Gert Sibande district. I started on 1 ha when I joined the Grain SA study group in Sheepmoor and I am currently farming maize on 5 ha. I am motivated and encouraged by my study group members and by becoming increasingly more successful in the production of maize. The fact that I can produce enough maize for my family and sell the rest to make ends meet is very inspiring. My biggest strengths are the fact that I am able to do things on my own, my eagerness to learn and apply new knowledge like no-till and being positive despite the drought. My biggest weakness is impatience. 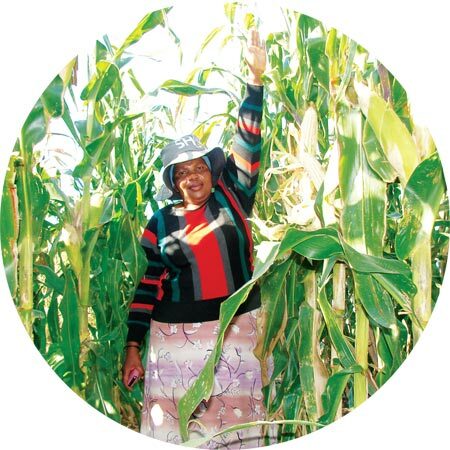 When I started farming four years ago I managed to produce 1 ton of maize which I thought was great, but I steadily improved and this year produced just more than 40 tons of maize. I kept 1 ton of maize for my own use and delivered 40 tons of maize at the Overvaal silo. This gives me an astonishing average of just over 8 t/ha. I never thought that these yields were possible but have since learned that by doing things on time and applying lime, one can achieve better yields. I admit that I was very lucky this year with rain which came when needed. The main contributor to my progress and success is the Grain SA Farmer Development Programme that provided me with training courses, advice, study group information, practical demonstrations and farmers days. I would love to be able to buy my own tractor and equipment and to plant different crops. Grain SA Farmer Development Programme, KwaZulu-Natal. For more information, send an email to graeme@grainsa.co.za.